These are the 5 frames I'm bringing to the Anthrocon Art show. For first time I'm carrying a really big one, which is old (I did it on 2011) but I don't have a proper place to put it in my home, I'm sure one of you would appreciate it more having it hanged on a special wall than me. If you are going to Anthrocon, don't forget to visit the Art show, there are always amazing anthropomorphic art, it's like a little museum to appreciate really good talent on our pretty fandom, and I think is the biggest furry art show in the world. 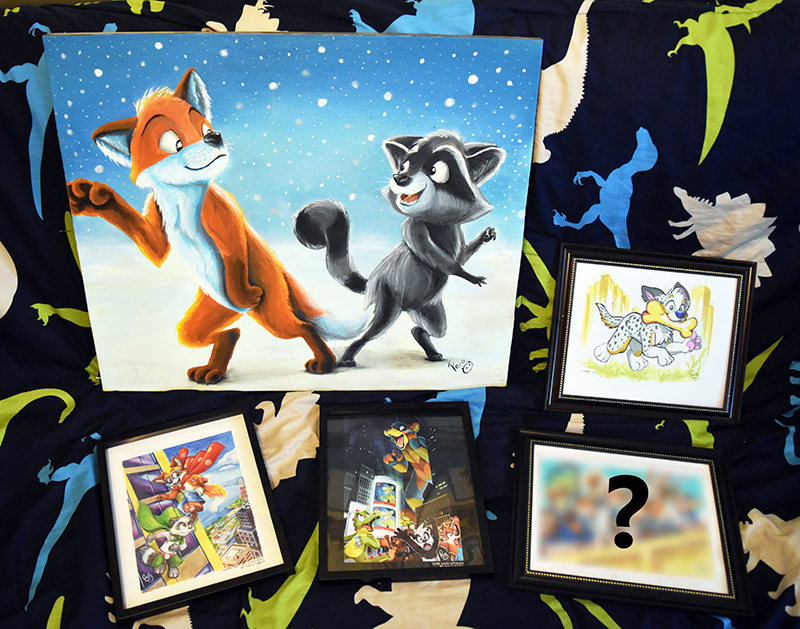 You can purchase any of these frames bidding on them at Anthrocon (not online) (only on friday and saturday, sunday is the day to pick up the purchased frames). You can see on this pic I'm carrying some originals, so this is your chance to have an original "paco panda". The "?" frame is an inedit that will be released on internet after Anthrocon, but for now will be exclusive for the Anthrocon's attendees eyes. If I had luck, it will be also printed on the conbook this year. Yes, that's the way I've met new artists that I hadn't seen before. I'm thankful when they put their own business cards on their panel, I always put some cards of me near my frames.